say about Removing Four Lower Snake Dams? In its Sixth Power Plan, The Northwest Power and Conservation Council ran a modeling scenario examining the effects of removing the lower Snake River dams on power system costs and carbon emissions. The Council analysis focuses on the need for replacement resources for the assumed loss of energy and capacity provided by the dams. The Council says "no estimate was made of the cost of replacing the other services provided by the dams. There are many other implications and costs of dam removal including the cost of removing the dams, future operating cost and replacement savings, substitution of other transportation modes for barge transportation (including fish transportation), changes in irrigation sources, and other factors. "These were addressed most completely in the US Army Corps of Engineers, Lower Snake River Juvenile Salmon Migration Feasibility Study, 2000. and have not been included in this analysis." The Council's analysis is included in Chapter 10, "Resource Strategy" under the section "Value Of The Hydroelectric System." The Council modeled several scenarios to show the power plan's impacts on retail power rates and consumer's electric bills with and without dam removal and with and without carbon penalties, or a possible "carbon tax." It tags 2019 as the year the dams would go out, but levels the impact on rates and bills over the entire 20 year period. In other words, the analysis includes 10 years in which the dams are still in place. Without dam removal and without a carbon penalty, retail power rates in the period 2010-2029, under the power plan's assumptions about conservation, would rise 0.4 percent. With the removal of the four Lower Snake dams in 2019, retail power rates would increase by 0.5 percent. For consumers in the period 2010-2029, under the guidelines of this power plan, without dam removal and without a carbon penalty, electric bills would drop by 0.7 percent. With dam removal and no carbon penalty, bills during this period would drop by 0.1 percent. The lower Snake River dams provide 1,110 average megawatts of energy under average hydro conditions, about 5 percent of regional annual electric energy needs. The dams provide 3,500 megawatts of short-term capacity, a little more than 10 percent of the total hydroelectric system capacity, and as part of the Automated Generation Control System. They also provide system reserves to maintain the reliability of the power supply, and, says the power plan, they provide "reactive support" for the stability of the transmission system. 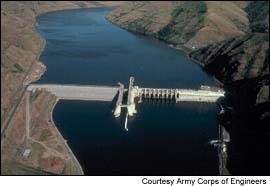 "The effects of removing the capability of the lower Snake River dams are mainly determined by the replacement resources that would be required for the power system to duplicate the energy, capacity, real-time load following, stability reserves and reactive support currently provided by the Snake River dams," says the power plan. "Dam removal increases the carbon emissions, cost, and risk of the power system. The projected changes to the power system to accommodate the loss of hydroelectric capability are not a simple energy and capacity replacement. Small increases in conservation and renewable resources occur in this scenario, but the primary replacement of the dams is provided by changes in the construction of new gas-fired resources, changes in the operation of existing and new generating plants, and changes in net exports. Existing natural gas-fired and coal-fired generation is used more intensively. In addition, the region exports less energy and imports more energy. The combination of these changes makes up for the lost 1,100 average megawatts of energy." Replacing the lower Snake River dam energy and capacity would result in increased carbon emissions of 3.0 million tons year, a 7.6 percent increase, says the Council. The power plan says that 1,103 megawatts "would be required to replace the dams with 437 average megawatts coming from carbon producing resources, not including increased imports that would also most likely come from carbon producing resources." Under the dam removal scenario, says the Council, annual cost of the power system increases in 2020 by over $530 million dollars. "Further, since the Lower Snake River dams serve Bonneville public-utility customers, those utilities and their consumers would bear the cost increases. Using a rate-making rule of thumb that a $65 million to $80 million cost increase translates into a $1 per megawatt-hour increase in Bonneville rates, a $530 million increase in Bonneville costs would raise rates by between $6.60 and $8.15 per megawatt-hour. Based on Bonneville's priority firm rate of $28 per megawatt-hour, dam removal would cause an increase of 24 percent to 29 percent." What Does Council's Sixth Power Plan say about Removing Four Lower Snake Dams?